While many are awaiting the release of BlackBerry 10 devices, there are still parts of the world where BlackBerry 7 smartphones have yet to land. RIM's current flagship device, the BlackBerry Bold 9900 has made its way into Russia. However, if you're a consumer wanting to get hold of the device you're out of luck as this launch sees it only available to business customers on the Mobile TeleSystems (MTS) and Vimpelcom carriers. There is no indication on whether it will be available to consumers in the future. For more information on purchasing the BlackBerry Bold 9900 in Russia, contact visit or contact Mobile TeleSystems or Vimpelcom carriers. Moscow, Russia - Research In Motion (RIM) (NASDAQ: RIMM; TSX: RIM) today announced the BlackBerry® BoldTM 9900 smartphone will be available for business customers in Russia through RIM authorised carrier partners Mobile TeleSystems (MTS) and Vimpelcom. The BlackBerry Bold 9900 smartphone is the thinnest BlackBerry smartphone yet and the first to offer the perfect union of a high-performance keyboard and touch display integrated within the iconic BlackBerry Bold design. It supports high-speed networks around the world as well as Wi-Fi® connectivity. 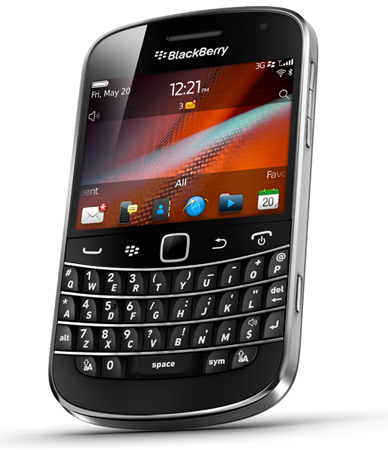 With its industry-leading keyboard, responsive high-resolution touch screen and high-speed browser capabilities, the BlackBerry Bold 9900 continues the tradition of delivering the world's best mobile communications experience with a highly refined and integrated suite of phone, email, messaging, social and business apps to keep customers connected and productive throughout the day. The new BlackBerry Bold 9900 is also the first BlackBerry smartphone to include built-in support for NFC (Near Field Communications), a new technology that is enabling many new and exciting capabilities, including the ability to make mobile payments, pair accessories or read SmartPoster tags with a simple tap of the smartphone. "We're excited to launch the BlackBerry Bold 9900 smartphone in Russia together with our partners MTS and Vimpelcom," said Paul Lucier, Managing Director for Russia at Research In Motion. "The Bold 9900 features the new BlackBerry 7 operating system and provides users with an outstanding communications, web browsing and multimedia experience. IT managers will also benefit from the renowned enterprise-grade features of the BlackBerry solution." The BlackBerry® 7 operating system introduces a next-generation BlackBerry browser that is among the best in the industry. Combining the dramatically improved performance of the advanced WebKit browser engine, together with the powerful hardware enhancements of the BlackBerry Bold 9900, means that browsing results are up to 40% faster than BlackBerry® 6-based smartphones and up to twice as fast as BlackBerry® 5-based smartphones*. Additional enhancements to this next-generation BlackBerry browser also include optimized zooming and panning for smoother web navigation and optimized HTML5 performance for incredible gaming and video experiences. For information about pricing and availability, please contact: Mobile TeleSystems (MTS) or Vimpelcom. * Testing was performed by RIM and measured average page load speeds using pre-release BlackBerry 7 software.